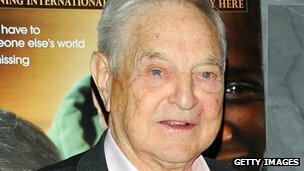 Billionaire investor George Soros has warned European leaders they have a “three-month window” to save the euro. He said he believed Greece would elect a government willing to abide by loan conditions imposed by the EU in this month’s elections. But he said the German economy would begin to weaken in the autumn, making it much harder for Chancellor Angela Merkel to provide further support. He said that while European leaders were focusing on debt levels, the crisis was “more of a banking problem and a problem of competitiveness”. “You cannot reduce the debt burden by shrinking the economy, only by growing your way out of it,” he added. Mr Soros, speaking at a conference in Italy, was referring to the drastic austerity measures that have been implemented across Europe, measures that are now being questioned by a growing number of politicians and commentators. Without policies to boost growth, which would enable governments to raise revenue to pay down debt, Mr Soros said time was running out for the euro. However, this would provide only temporary respite, he warned, as the German public becomes less willing to continue bailing out its weaker European neighbours. Previous story Did U.S. Develope Stuxnet?